One moment Anna was happily chatting away in the seat beside me and the next, after a resounding thud, all became ominously silent. Her features frozen momentarily in the mid-word, tell-all expression of a popular coarse expletive. Both eyebrows up, teeth bared, slight flaring of both nostrils, followed by a complicated series of eye rolling movements coordinated with lips, teeth and both hands being pushed through her hair. Once everything eventually came to a rest, the actual expletive sprung forth. By then, I’d already said it at least five times. A quick inspection revealed the issue: the right back wheel of the Star Vision Alpha A had burst through the thin ceiling of, not so much a wombat burrow, rather the ceiling of a wombat mansion. So cavernous was the marsupial’s crib the driver’s side wheel was floating in the air, the entire right-hand side of the camper resting on its chassis. Safe to say, we'd failed to properly evaluate the offroad obstacles we faced. A light drizzle began to fall. It was nearly 5pm. The solitary hour of daylight left was further muted by low-slung battleship grey skies. Another expletive. We were in the middle of the bush, and in the bush, no one can hear you swear. A quick inspection of the Isuzu MU-X's boot and other storage compartments yielded no comfort. Cameras, tripods, drones, pots and pans, a few sleeping bags and more cushions than the Queen of England’s favourite settee. No shovel, no max tracks, no lever-like implements. We’d concentrated too much on the media production component of the trip and not enough on preparing for the likelihood of a wicked bog. How do you get out of situations like this? A experimental tap on the accelerator suggested we’d need to ram forest matter into the gap beneath the tyre, giving the wheel something to grip onto. This was immediately obvious. Also obvious, was the necessity to carve out a less severe incline for the wheel to follow once it accrued some forward momentum. Off I jogged towards a curl of smoke I spied over the tree line, on a mission to obtain a shovel. An hour later the light was failing. The shovel I’d borrowed from the nearby cabin in the woods, after clearing about a tonne of hard-packed clay, had snapped in two. Perhaps the owner would pop back out in a leather apron brandishing a chainsaw above his head? I decided not to mention this to Anna. The free space beneath the suspended wheel was chock full of twigs, sticks and other grippy forest flotsam. I managed to get a bar of signal on my phone from a high point on top of an ant hill. I’d met the dude in the cabin, Anna had not. Plus I’d broken his shovel. A snap decision was made. Help was called in from a garage 30 minutes away that I’d found on the internet, mere minutes before its sole winch-affixed vehicle was due to head home for the night. The vehicle soon arrived, hooked us up and dragged us free without fuss. Anna breathed a sigh of sweet relief, the worldless expletive-etched strain on her face released. She wasn’t condemned to a rainy night in the bush up to her eyeballs in mud with me and perhaps a wombat or two for company. Hours before things had been much different. We'd been happily camping by a babbling brook testing out the Alpha A’s comfort stats. And the rear folding entry-level camper from Star Vision was checking all the boxes. With a quick press of a button, the hydraulic folding system had arranged the camp setup, no bother. A queen size memory foam bed up front over the box was roomy and cosy, and a well put together 14oz ripstop canvas tent had sprung up into place above everything, no trouble at all, in less than ten minutes. A toolbox slide-out up front was securely shrouded in aluminium checkerplate and the exterior superbly finished in sleek metallic grey two pac duco. Outside, a four-burner kitchen slide-out and food prep area did the job. I mean, for less than 11 grand, the outdoor amenities proved way more than passable. In fact the general tone of the entire testing process was about how Star Vision have managed to pack a whole heap of camper into a price point less than eleven gorillas. There’s more gorillas in Taronga Zoo than there is on the Alpha A’s price tag (don’t hold me to that, I rang the zoo but no one could tell me exact gorilla numbers). Yep, all things considered, the key aspect of the Alpha A is its miniscule price. Never ask this question of a Scotsman. If David Forrest, Camper’s Queensland via Edinburgh business manager, asks you this on the phone, hang up immediately. In the case of the Alpha A, though, the question is a pertinent one. With the Tare a featherweight 825kg and with a fully loaded ATM of 1500kg, the Alpha A should positively bounce behind your rig and be ripe for set up as readily as a jolly jumbuck camped by a billabong. Towing with the Isuzu MU-X, we took it up hill and down dale, over ruts and through muddy bogs, and aside from the incident with the enormous burrow, which was Anna’s fault, not the camper’s, the Alpha A took all in its stride. 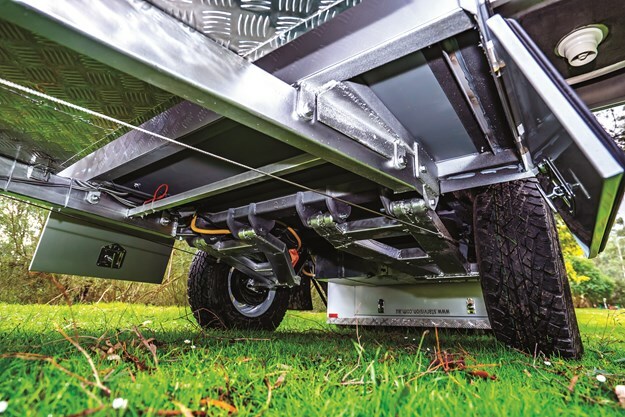 The Alpha A is fully equipped with independant twin shocks, coil suspension and a polyblock hitch up front on the business end. Between it and the tow tug, there’s ample grunt for a 4WD mission up a rain washed hell-hole, should you wish to go that way. As well, it tows almost imperceptibly upon more traditional roads, and with its tiny Tare, it isn’t too thirsty at the bowser either. We took the Alpha A out into the Victorian bush in September. We should have known better. It was wet, it was cold, the ground was, well, yielding. Despite the less than ideal camping conditions, the Alpha A was warm and snug. I happily sat under the annexe in an easy chair reading a book as rain pelted the canvas outside. Anna chilled up front in the queen bed, happy as Larry. When weather turns severe, it’s best to let it play its course and put plans on hold. But it struck me, like a frozen bag of peas thrown by an angry lady. Often downtime, enforced or otherwise, is the best part of camping in the bush. It’s a wonderful realisation – that there’s actually nothing to do but pull a book from your pack, find a nice dry spot, settle down in peace and quiet for a few hours, unplug from everything and read until sleep takes hold. I still have a fond recollection of dozing off in a camp chair underneath the Alpha A’s annexe awning, the sound of rain teeming against the canvas, lulling me off into a delightful meditative kip. Little did I know then, that in a few hours, I’d be knee-deep in a wombat’s domus. 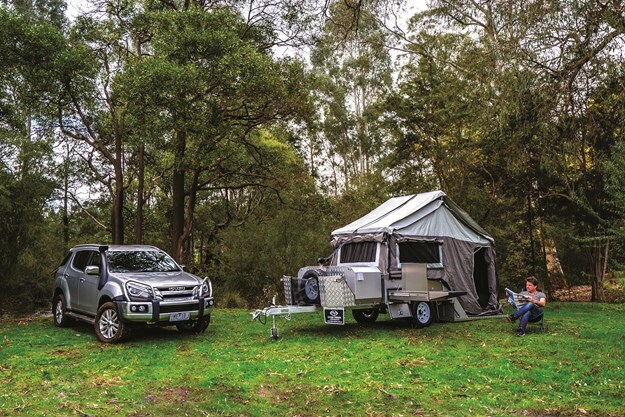 The Alpha A is a perfectly pitched entry-level camper. Let me count the ways. 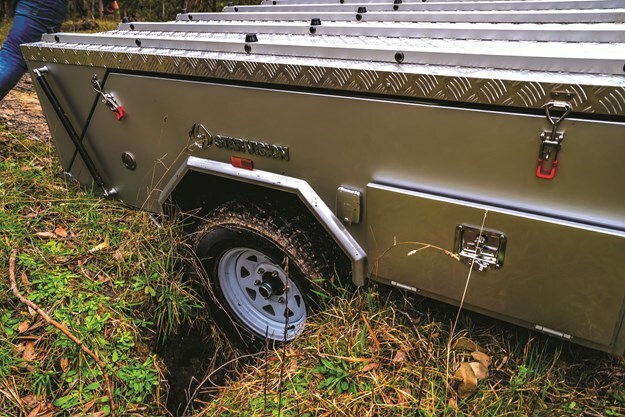 It’s compact and tight, fitting snugly behind any tow tug. 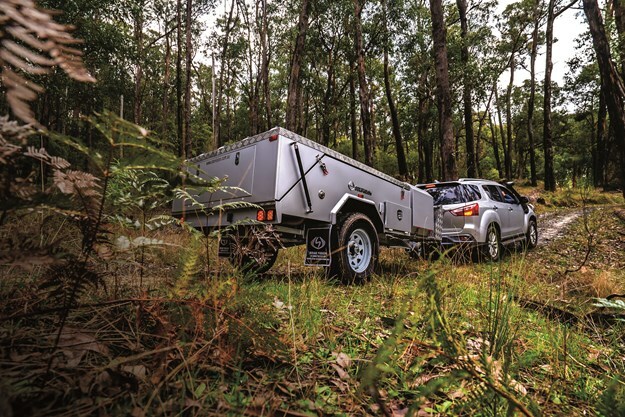 At just 4.6m from hitch to tail-lights, it shouldn’t be a handful for those relatively inexperienced with towing. 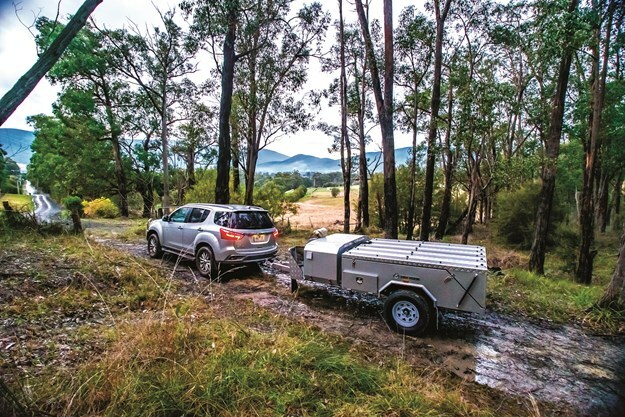 It’s lightweight and adequately equipped underneath for most offroad escapades and finally, the price. It costs about the same as a mid-spec road bike, just shy of 11 grand. Plus, have I mentioned? It bounces unscathed from gargantuan wombat burrows. Enough said.